This large size Kelty photo of Ringling Bros. and Barnum & Bailey shows Col. Tim McCoy and His Congress of Rough Riders of the World. McCoy was featured in the after-show during the 1935 season. This photo is valued at $300-$400. 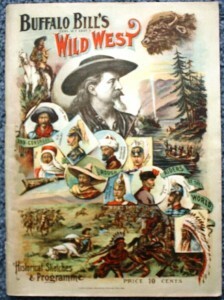 Collecting wild west show memorabilia is as important to circus collectors as collecting circus memorabilia. The history of the wild west show brings to mind names of great traveling shows and their attractions—Buffalo Bill’s Wild West and Congress of Rough Riders of the World, Pawnee Bill’s Historic Wild West, 101 Ranch Wild West Show, Buffalo Bill, Annie Oakley and Chief Sitting Bull. 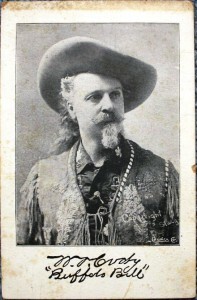 Buffalo Bill Wild West postcards can be bought for as little as $25 to $30. This one was printed and sold during the 1903 European Tour. 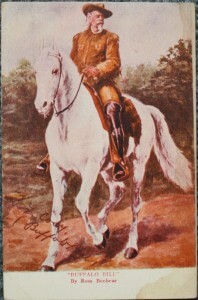 This card was taken from a Rosa Bonheur painting and has a printed signature. 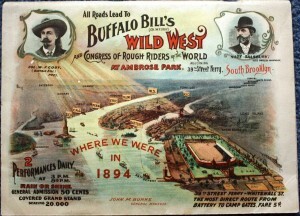 This Buffalo Bill Wild West postcard shows buffalo in the open air arena. This printed card has a simulated autograph printed below the image. It was produced by the Courier Co. Value is $75-100. 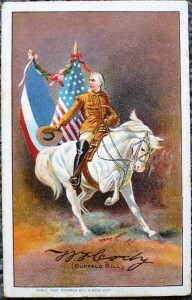 The reverse of the 1895 Buffalo Bill program. The value of this program is $300-350. 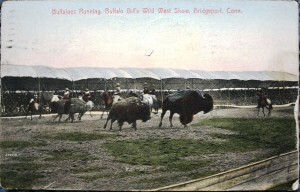 Even up through the middle of the last century, circuses featured wild west stars in their shows or in the after-show. The after-show, sometimes called the concert, was scheduled immediately following the main circus performance. For an extra fee the audience was allowed to stay in their seats for this show. The after-show was not always a wild west performance, but that was the norm. In 1935 Ringling Bros. and Barnum & Bailey designed special posters promoting Col. Tim McCoy, Idol of American Youth. Ken Maynard was a famous western star appearing in nearly 100 motion pictures. In 1936 he took out Ken Maynard’s Diamond K Ranch Wild West Circus and Indian Congress. 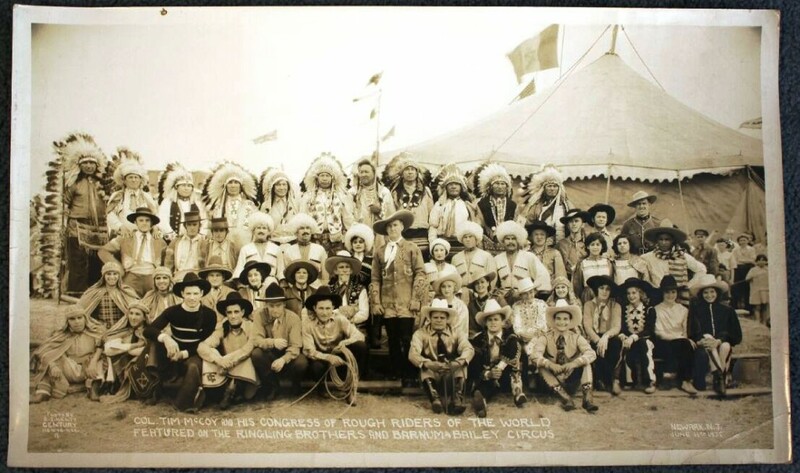 The reverse of the Ken Maynard’s Diamond K Ranch Wild West Circus and Indian Congress. This herald is valued at $50-$75. Among the most sought-after circus collectibles are route rooks. The same can be said for wild west show collectibles. See my article on Circus Route Books – A Record of the Past. 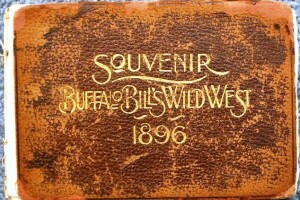 This is a route book for the 1896 season of Buffalo Bill’s Real Wild West. The listing of staff members inside includes James A. Bailey as Director of tour. This is the same James A. Bailey of who teamed with P.T. Barnum. Charles R. Hutchinson is listed as Treasurer and Dexter Fellows is listed as press agent. Both had a similar job on Barnum & Bailey in later years. Value is $450-$500. •	“The Wild West, A History of Wild West Shows,” by Don Russell. Copyright 1970 Amon Carter Museum of Western Art. •	“Buffalo Bill’s Wild West, An American Legend,” by R.L. Wilson with Greg Martin. Copyright 1998 Random House. •	“The William F. Cody Buffalo Bill Collector’s Guide With Values,” by James W. Wojtowicz. Copyright 1998 Collector Books.